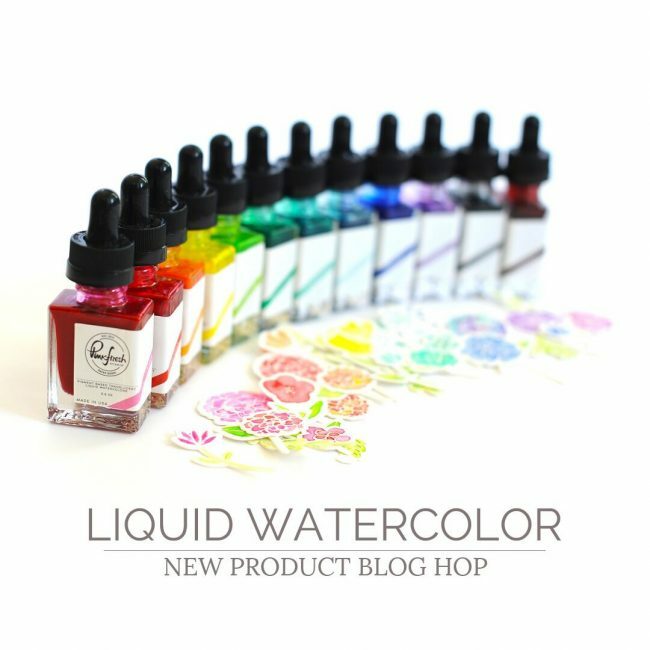 Are you hooked on all the new liquid watercolors coming out lately? There’s more! And I have to say – the colors in this set just make my heart happy! I’m not even a pink girl but that Bubble Gum? YUM! These 1/2 ounce bottles contain lovely colors that I’ve used for today’s CAS cards you’ll see below…..and scroll further to see something else I painted with these since the making of this video! Watch the video below or click HERE to see it in HD on YouTube. I tried out the fruit against several card base colors, and liked white and black a lot but OHHH were these fun on Desert Storm! 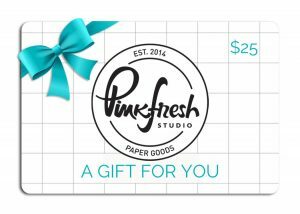 The Pinkfresh Studio blog will be giving away (1) set of Liquid Watercolors, and (2) $50 giftcards. And I’m giving away a $25 giftcard on this blog post…winners will be picked from the comments! Winners will be posted on Sunday, June 10th on Pinkfresh’s GIVEAWAY PAGE. You must check that page & claim your prize within 2 weeks. The hop list is on their blog, go see it to hop along and enter to win on ALL the blogs! What a wonderful set of cards! Love how bright and vibrant those colors are! Oh they are such beautiful cards! Love how the fruit turned out! Fruit perfection! I adore CAS cards! These are such fun and colorful cards—love them! Scrumptious colors! 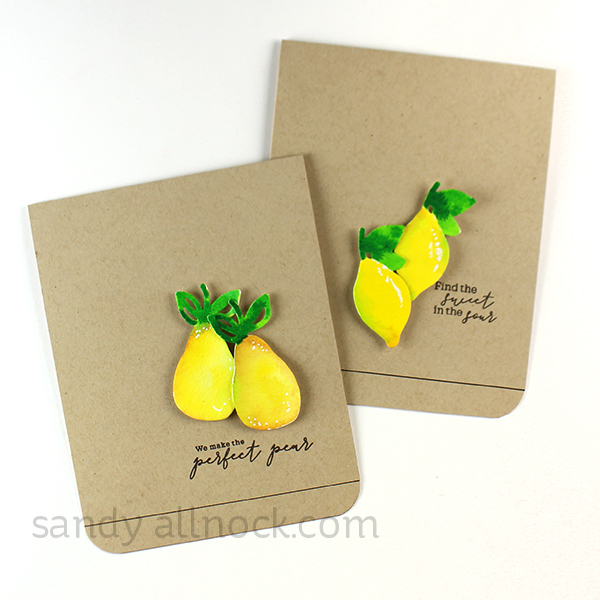 Love your set of cards with the fruit! Very nice. Love your videos. Beautiful colouring, Sandy.! Thanks for choosing yellow. So cheery. I love these CAS cards…ny favorite kind! These are awesome ! I have yet to try any of the bottled watercolors! i am very intrigued by the liquid watercolor. i love the cards you created also! What amazing cards! Beautiful coloring! I love how the bright colors pop off the desert storm cardstock. And once again, I am reminded of the magical powers of gel pens on top of watercolor. Thanks for showing us this lovely technique. 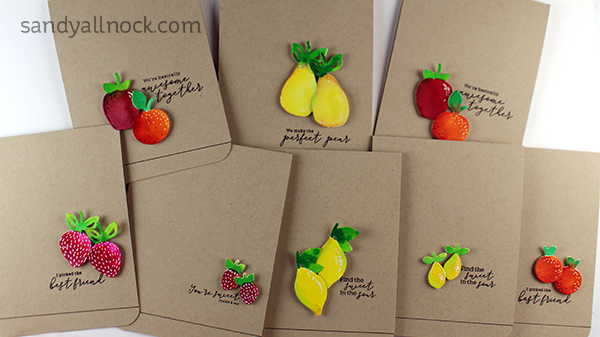 I love fruit, so these cards are right up my alley!!! So cute; and those watercolors are pretty yummy looking!! Love your cards. These paints look amazing. So vibrant. Such a fun set of cards – love the bright colors. Your fruit is so vibrant. Great cards. 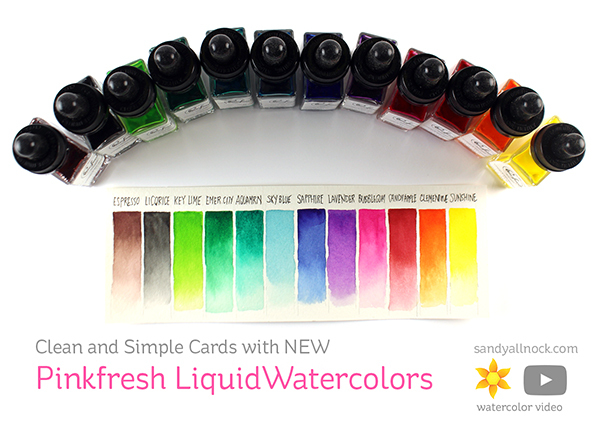 Thank you for sharing all the new pinkfresh watercolors next to each other, Beautiful! How cute and yummy and fresh is this bundle of cards !! Awesome job as usual !! Sooooo colorful fresh fruits I love!!!! These colors look great!